Google recently announced updates to their Maps API script, with more updates planned this summer for their overall Maps platform. 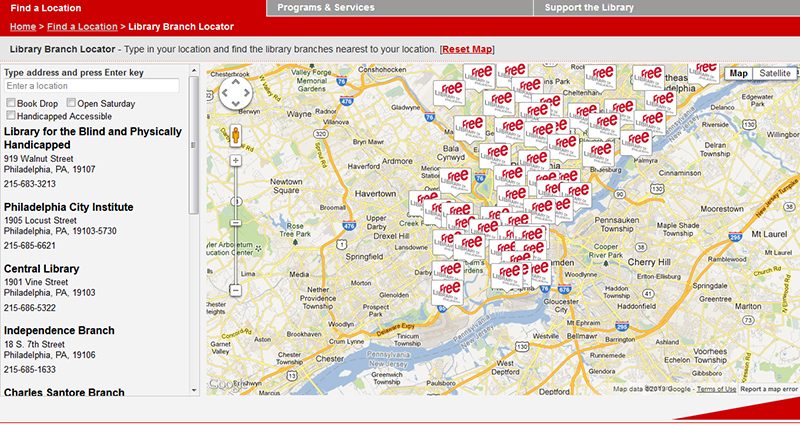 The Free Library uses this API to display Google Maps in various locations on our website, most notably our Branch Map and Map Mosaic. In preparation for Google's update, Free Library web development staff worked to upgrade the code and data displayed on the maps, as well as add some new usability features for our customers. 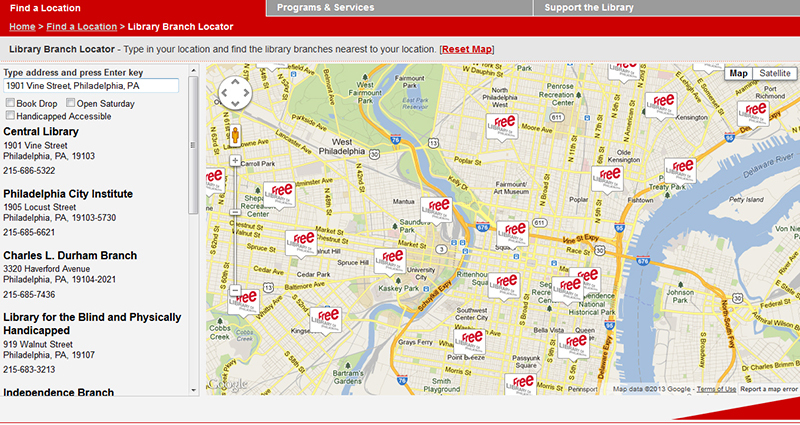 The branch map has been updated to perform like most common “store locators” found on popular retail websites. 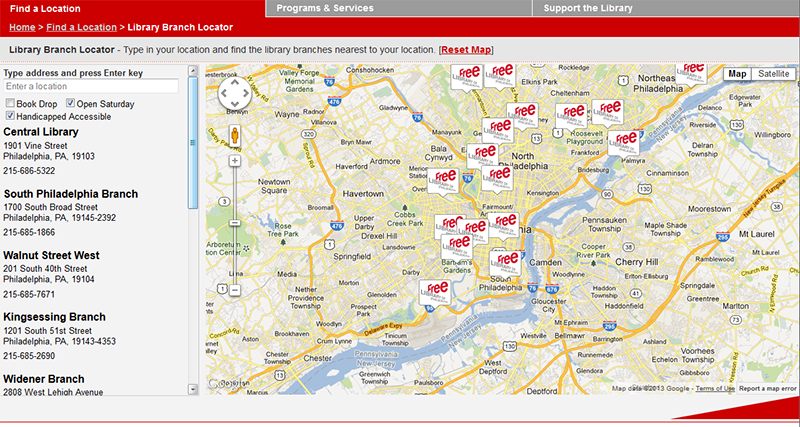 You can now quickly view all library branches on the map at once or select which branches are open on Saturday, have a Book Drop, or are handicapped accessible. When you click on an icon, you can see the branch address, phone number, and business hours. 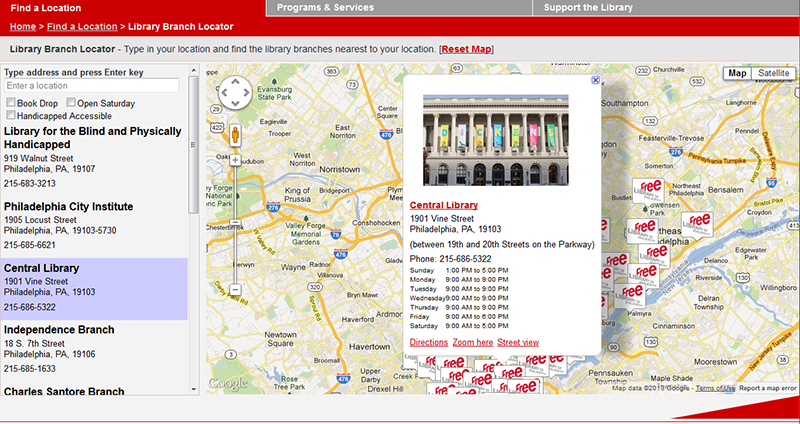 Customers can also type in their location and find their nearest library branches. 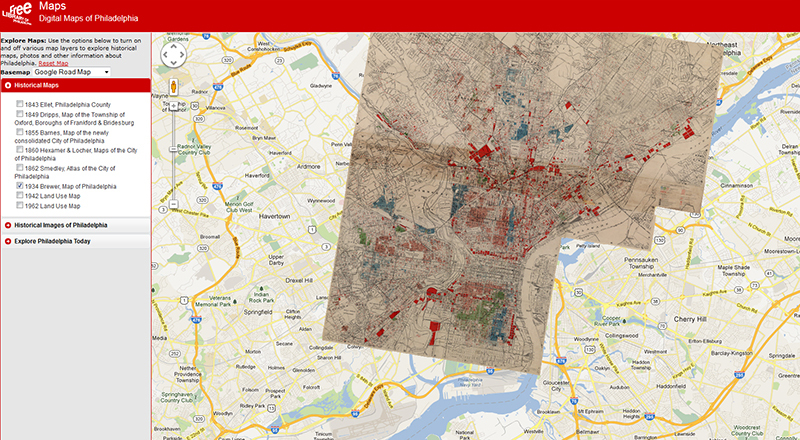 We've combined our map mosaic and HIP (Historical Images of Philadelphia) map into one robust and interactive digital map for customers to explore our vast collection of historical maps, digital images, and newly gathered map data for the Philadelphia region. 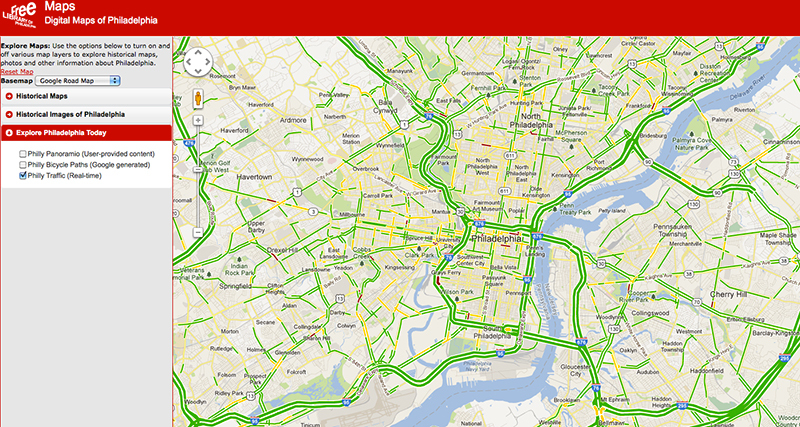 You can select from 4 different Google Map displays: Road Map, Earth Satellite, Hybrid Map, and Terrain Map. 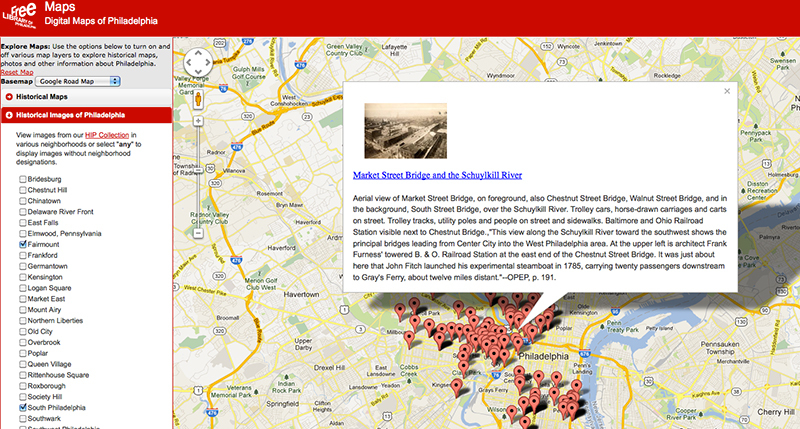 From the Historical Maps drop-down menu, you can select various historical maps to overlay on top of Google map of Philadelphia. 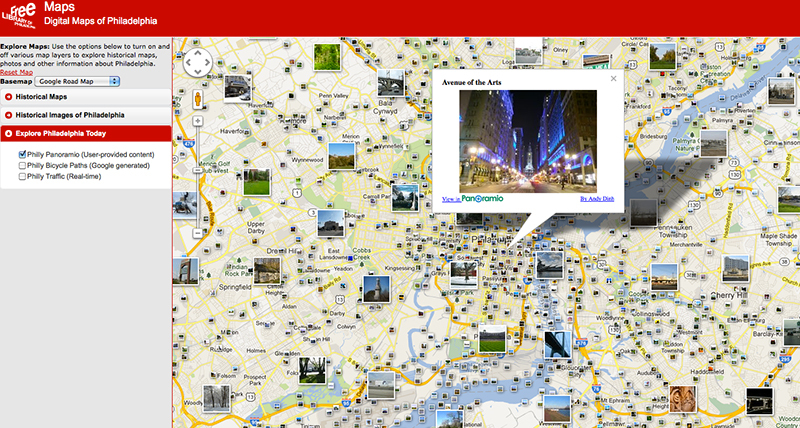 The screenshot below is displaying 1934 Brewer Map of Philadelphia overlaid on top of a Google Road Map of Philadelphia. From the Historical Images of Philadelphia drop-down menu, you can select from numerous neighborhoods and see historical images from bygone eras of Philadelphia. 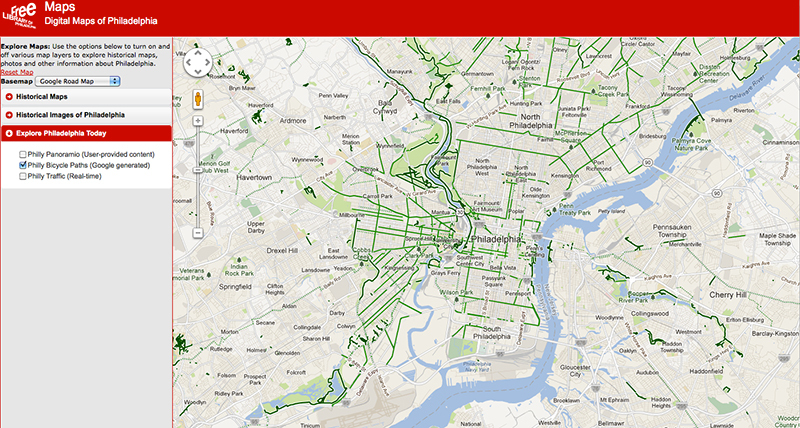 We also added a new section entitled “Explore Philadelphia Today” which displays user-generated photos (via Panoramio) from around the entire city, Philly bicycle paths, and traffic in real-time. We hope to add more helpful city services data and features to this section in the future (i.e. list of Philadelphia Public Schools, Hospitals, Parks, etc.). There are many viewing options and configurations you can set on these maps, making it a truly immersive experience! Try out our new map features and leave us some feedback below!